RRC # 8 Deadline: August 10. Check out all the details at Food Maven . MAJOR thanks to Rachel for hosting RRC#8!!! Interested in hosting an upcoming RRC? Send me an email at LauraRebeccasKitchenATgmailDOTcom . For RRC #8, Rachel of Food Maven and Coconut and Lime saved me from food carnival burn-out. Not only did she assume the mantel of hosting duties but she devised a terrific — if not ingenious — theme. It’s called “Retro Wobbles but it Won’t Fall Down.” Awesome idea, right? I love it. So after much searching, and then rejecting, of recipes (go AWAY, tomato aspic!) I finally picked up my copy of the Fannie Farmer Cookbook (originally published in 1896 under the title The Boston Cooking-School Cook Book by Fannie Merrit Farmer) and thumbed through its pages. There, I stumbled upon a recipe my mother had made frequently when I was very young, but I hadn’t tasted in years: baked custard. The recipe is very simple to make (stir, add , stir, pour, bake), and very easy to adapt. At the last minute, I decided to make the coconut variation by tossing in a 1/2 cup of flaked coconut. The end result is the egg custard I remember with a layer of coconut at the top. Not bad at all, but I think I’d prefer it with coconut flavor throughout the custard, not just at the top so next time, I’d add a bit of coconut extract. Having said that, the (coconut free) custard is just as I remembered it: smooth, lightly sweet and rich. Comfort food, plain and simple — it’s so, so good. Preheat the oven to 350-degrees F. Butter a 1-quart baking dish or 8 ramekins. Se a shallow pan large enough to hold the baking dish or ramekins in the oven, and fill it with an inch of hot water. Beat the yolks and eggs together just enough to blend. Stir in the sugar and salt. Slowly add the hot milk, stirring constantly. Add the vanilla. Strain into the baking dish or dishes and sprinkle with nutmeg. Place into the water-filled pan and bake for about 45 minutes ; the custard is set when a knife inserted in the center comes out clean. 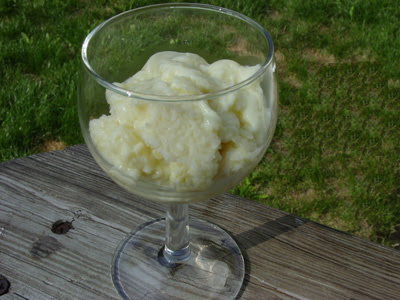 ** Coconut variation: substitute 1 1/2 tsp vanilla for 1 tsp. vanilla plus 1 tsp coconut extract. After straining the custard, add 1/2 cup flaked coconut before pouring it into the baking dish(es).